Box scores will most of the time give the reader a basic snapshot of how a team won or lost a game, but not all the time. It will certainly not give a clue as to how a slide may have contributed to six runs. The box score from the Hickory Crawdads 8-1 win over Savannah on Sunday will show Jose Trevino’s two-run homer in the sixth inning put the team ahead to stay. However, a play in the seventh had a bigger effect on the game. The runs that tallied and the error charged draw only a hint as to what may have happened. After dodging a bullet in the seventh, the Crawdads clung to a 2-1 inning heading to the bottom of the inning. Jairo Beras pulled a slider through the hole at short for a hit. Rock Shoulders then lined hard to right for a single to set up a sacrifice situation for Carlos Arroyo. The bunt by Arroyo was a roller along the cut of the grass toward third and his hustle beat the throw to first to load the bases. 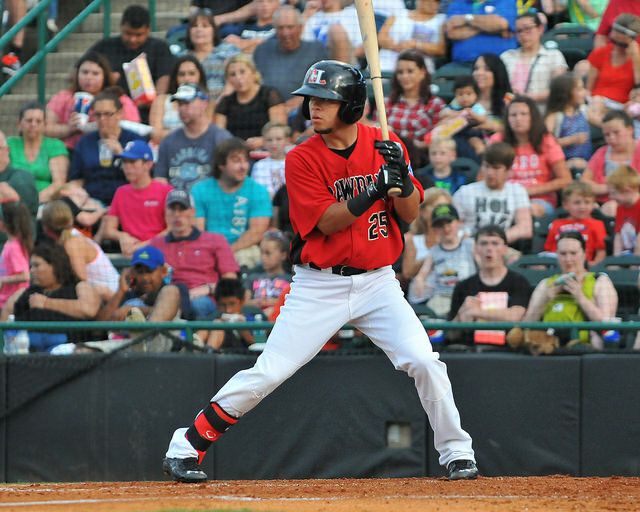 Michael De Leon struck out to set up Josh Morgan, the Crawdads hottest hitter from the last month. Morgan pulled a curveball from Sand Gnats reliever Darwin Frias to Luis Guillorme at short for what appeared to be a momentum-shifting double play. Guillorme fielded the roller cleanly and flipped the ball to Jonathan Johnson at second. Johnson made the turn and just at the moment he was to throw the ball, Arroyo took out the legs of Johnson, which affected the relay to first and bounced past Jon Leroux. Beras scored on the original fielder’s choice with Shoulders rumbling home on the overthrow. The play set off a huge reaction in the dugout. Prior to reaching the dugout, Arroyo ran past Crawdads manager Corey Ragsdale, who gave Arroyo – who had joined the Crawdads just a week ago – the same hardy handshake as he had to Trevino rounding the bases the previous inning. Arroyo was welcomed back to the dugout with a hero’s welcome. Though the slide had nothing to do with anything on the field in the eighth, an argument could be made that it led to six runs, as the Crawdads players had a quicker step on the field after it. In the eighth, Morgan made a brilliant backhand stop on a short hop behind the bag at third before rifling a BB across the diamond to catch the speedy Wuilmer Becerra. Hickory went on to bat around in the eighth and collected four more runs to cruise to the win.